A year after graduating from college, women are earning thousands of dollars less per year than their male peers. 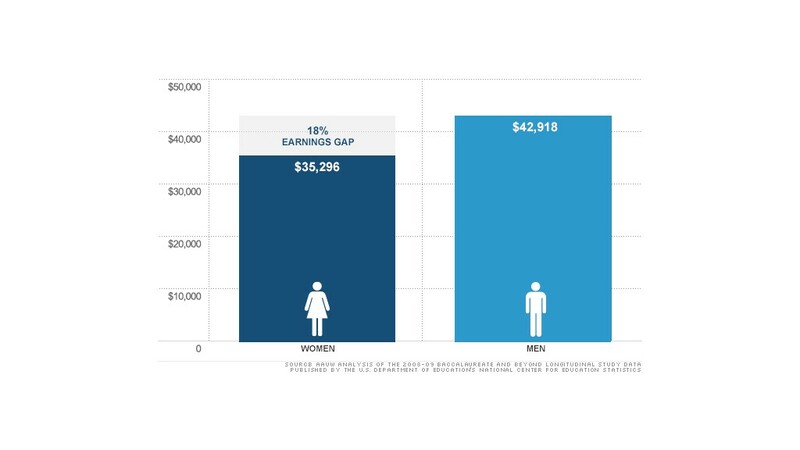 While men earned average salaries of $42,918, women earned $35,296 -- a nearly $8,000 difference, the report found. Why the gap? Men typically choose majors that result in more lucrative careers post-graduation, like engineering. Even if men and women major in the same subject, men tend to end up in higher-paying jobs. Men also work more hours, according to AAUW. But even when controlling for these factors -- by looking at men and women with the same majors, jobs and hours -- women were still paid 7% less than men. Female business majors, for example, earned a little over $38,000, while men earned more than $45,000. Among men and women who took teaching jobs, women earned 89% of what men earned. And while men reported working 45 hours a week compared to the 43 hours reported by women, among those who said they work 40 hours a week, women earned 84% of what men earned (across all jobs). Other less measurable factors may also be at play, such as gender discrimination and willingness to negotiate salary, which studies have shown men are more likely to do. Debt piles up for female grads: Thanks to this pay gap, women are spending a much bigger share of their earnings on monthly student loan payments. While women and men borrowed similar amounts of money to fund their education, nearly half of women were paying more than 8% of their earnings toward student loan debt in 2009. Less than 40% of men were paying the same amount. The AAUW estimates that based on pay, it's unmanageable for women to spend more than 7.8% of their earnings on student loan debt. Yet, 53% of women paid more than this. Meanwhile, 39% of men paid more than the 8.9% threshold that AAUW says is affordable for men. "It's shocking that these numbers are as high as they are, and it suggests to us that student debt continues to grow but we're not seeing the same increases in wages -- and women's wages in particular are not keeping pace," said Hill.